I first have to start off by thanking all of you for your ideas and encouragement on helping Aurora with her alphabet. We are trying a few different things and she is already responding very well. I think she just needed learning to be fun again, and honestly between you and me I think her teacher is not very good. She seems to have a way of squashing all the fun out of it, and they are at school all day and very rarely get recess not even at lunch. Well moving on if you have ever met Aurora you know within just a few minutes that she is quite the drama queen, and drama queens love being the center of attention. She is also very smart (even if she doesn't like reading). Well she had the opportunity last night to demonstrate her many talents in a way she will never forget. 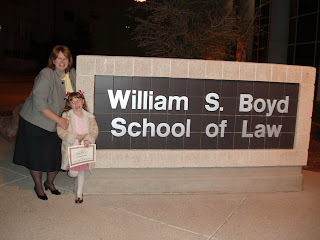 As many of you know my mom is currently a second year law student at Sam Boyd's School of Law at UNLV. 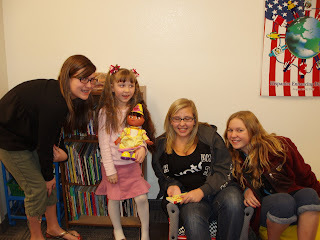 This new semester she is taking a class in the children's court clinic. This is a very special clinic that is getting nation wide recognition. 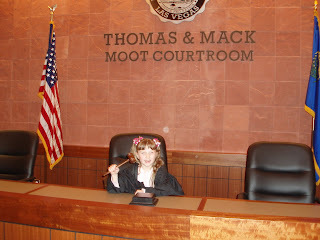 It is a special mock court that helps children get ready for their real life court appearance. Often times terrible things have happened to these children and now they are required to go in and testify against the people who may have done these things to them. I can only imagine how absolutely terrifying this experience can be. That is why the children's court clinic was established. The children go in and first learn about how a trial works. They tell the child about a story about a child who has had his bike stolen. 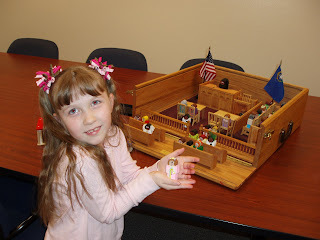 They have the children act out the scenario with little wooden people and a model court. They teach them all about how the court works and who the different people are. They even teach them breathing exercises and how to talk to themselves if they get nervous. They then go into a real court room and get to take turns acting out the part of the judge and the witness being questioned about their bike being stolen. Law students act out the other parts. Last night the law school put on a special fundraiser for some big wig "rich people" (as my mom put it to Aurora) to help earn more money for these special clinics. They needed some kids to demonstrate the process for the schools investors, and my mom suggested Aurora. Aurora ecstatically agreed. We arrived an hour earlier then the investors and they went through the whole process with the kids. Here is a pic of Aurora with the court model. She is holding her favorite person from the jury. This is during a break before going into the court room. Obviously Aurora was by far the youngest. The three others are thirteen. The one on the far left is the daughter of the professor over the kids court and the two others are her friends. 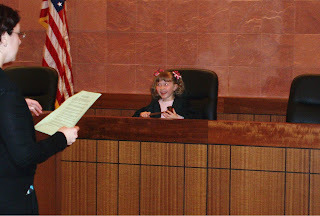 This is when Aurora acted out the part of the judge. The man was guilty no matter how good the lawyer's defense was. That's one of the lawyers in corner talking to the witness. 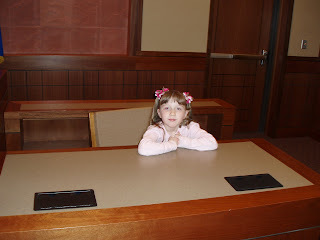 This is Aurora in the witness chair. The investors were in a room behind us being told all about the kids court while they began having the girls take turns doing the different jobs. They saved Aurora for the last in the witness chair so the investors would see her during the questioning. It was completely impromptu and I have to admit I was a little nervous to hear what was going to come out of her mouth. There were about 40 investors that squeezed into the small court room, but they did not mind, Aurora completely captured them! She was amazing! She did her part perfectly. From when my mom swore her in (she was the bailiff) and the lawyer having her state her name to the defendant being pronounced guilty, the audience was completely captivated. She told her story all about her purple bike with green butterflies being taken while she was in her house getting a snack. I was also captivated by her so when my mom asked if I had noticed the audience reaction I told her no. She said they swooned over every word she said. Afterwards the Professor of the clinic came to Aurora and told her "Thank you so much for making me look good!" My mom told us all the deans of the school were there too, and said "if only having a super cute and talented granddaughter could get me an A in this class." Aurora was the star of the evening and she had an absolute blast doing it! That is awesome! You need to get that girl onto acting classes right now! She will be the next big thing!! :) Sounds like a lot of fun!